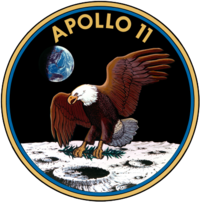 English: The Apollo 11 mission landed the first humans on the Moon. 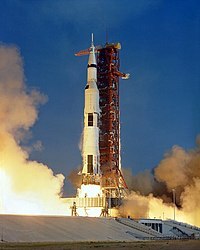 The launch occurred on July 16, 1969. Apollo 11 - Landing on the Sea of Tranquility - July 20, 1969, 16mm landing film. Neil Armstrong describes the Moon's surface before setting foot on it. Buzz Aldrin steps onto the Moon. A two minutes montage of Apollo 11 mission events highlights. Comparison between the original and the newly restored Apollo 11 video showing Neil Armstrong making his way to the lunar surface, by climbing down the lunar module ladder. Comparison between the original and the newly restored Apollo 11 video showing Buzz Aldrin following Neil Armstrong down the lunar module ladder. Comparison between the original and the newly restored Apollo 11 video showing Neil Armstrong reading the Apollo 11 plaque that is dedicate to that mission. Comparison between the original and the newly restored Apollo 11 video showing Neil Armstrong and Buzz Aldrin raising the American flag on the moon. A short video showing the events of the Apollo 11 Mission. Questa pagina è stata modificata per l'ultima volta il 12 mar 2019 alle 00:35.